Performance management software that’s easy for novices, with a simple interface and solid feature-set. When you first look at Smartsheet, the similarities with Microsoft Project become apparent. By default, they both use a spreadsheet-like interface next to a Gantt chart. You can also create sub-tasks through indentation, attach files, and assign task dependencies via the Predecessors column in the spreadsheet view. There is also a calendar view and Kanban boards, but it doesn’t have a built-in timeline view – instead, it opts for integration with the third-party service Office Timeline. Smartsheet is built for the web, offering easy integration with third-party tools and the ability to share specific parts of a project with select people. Like many other web-based tools, the comments support “@mentions” to make sure specific people see the information they need, and there’s a highlight feature to see the most recent changes to a project. Starting life in 2005 and debuting to the public in 2006, Smartsheet is essentially an easier version of Microsoft Project. It has that familiar spreadsheet-like interface, but lacks the depth and complexity that keeps some users away from Microsoft’s desktop app. It’s also web-based, which is pretty much the standard for modern project management software, with very few desktop-first products available outside of Microsoft Project. Smartsheet offers subscription plans that are suitable for companies of all sizes, from individual freelancers to medium-sized businesses and enterprises. 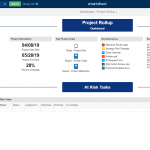 If you’ve ever spent time using Microsoft Project, then Smartsheet will be immediately familiar. 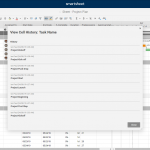 Like its more famous rival, Smartsheet’s default view is a dual pane interface with a spreadsheet for tasks on one side, and a Gantt chart showing the project’s workflow on the other. Just like Project, there are cells for adding comments, attaching files, and assigning start and end dates to tasks that are then reflected in the Gantt chart. There are also multiple views, such as card and calendar. Smartsheet contains features common in web native services, such as @mentions to notify team members about important comments. However, its autosave function could use a little work, while its third-party apps are limited. And while we didn’t miss it in apps such as Asana and Trello, it feels like Smartsheet would benefit from a real-time chat feature. Smartsheet’s Workspaces allow managers and teams to share items within a certain project, without handing outside parties access to everything. You may want, for example, to give a stakeholder access to certain reports, but not the task list. Meanwhile, a freelancer may need to see the task list, but doesn’t need access to any reports or the project dashboard. You can also attach necessary files to a workspace, as well as leave comments for team members. There are two features that help users see changes that have been made to a project. The first is Highlight Changes, which is represented by the highlighter icon in the toolbar. Activate this feature, and Smartsheet will highlight in yellow (or whatever color you choose) all changes made to the project in the last hour. If every 60 minutes is too much, highlight Changes can be adjusted to show changes every few days, or from a specific date. Right-clicking on a cell also shows an option in the context menu called View Cell History, which displays in a pop-up window all of the changes made to that specific cell. Anyone new to project management, or who just needs to get a project up and running quickly, can use Smartsheet’s Solution Center. This area has a variety of templates for different project types, such as a personal task list, annual tax prep, contact management, sales tracking, and more. The Solution Center is also where Smartsheet keeps its third-party add-ons for Google Drive, Power BI, Slack, and Salesforce. Smartsheet doesn’t have as wide a variety of add-ons as other services do, and some common items are missing – this includes GitHub, and any CRM services that aren’t Salesforce. Many popular options are available, although some of these add-ons require an additional cost. This video from Smartsheet provides a basic overview of the software, and how to use key features such as conditional formatting, editing rows and columns, and switching views. Smartsheet has four different pricing tiers, but only two have public pricing. The Individual plan for a single person costs $14 per month, billed annually. For that money, you get to use up to 10 sheets, invite up to 10 collaborators per item, use of a single dashboard, and enjoy 50GB of storage. The next tier up is Business at $25 per user, per month, billed annually. This tier requires a minimum of three users, and supports unlimited collaborators, 100 sheets per user, and extra features such as an activity log and connections to analytics tools, such as Tableau, Qlik, and Spotfire. There are also two tiers for large organizations, starting with Enterprise, which adds unlimited everything – including sheets, dashboards, and collaborators – as well as single sign-on using SAML-based providers and various domain-based administrative controls. Finally, there’s Premier, which offers all the features of Enterprise, as well as premium features such as granular sharing control and the Pivot App for making pivot tables. This tier also offers access to premium add-ons such as Salesforce and Jira. 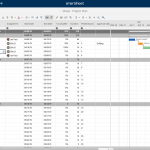 Smartsheet is a great tool that is fairly easy to use, especially if you’re familiar with organizing projects via spreadsheets or Microsoft Project. While it has all the essentials, Smartsheet comes up lacking in some of the finer details. Its auto-save feature, for example, isn’t automatic, and while it can auto-save every minute, it behooves users to do manual saves before closing. It would also be nice if you could see a preview of any comments when you hovered over the comments cell for a given task, and it also feels like real-time chat is a missed opportunity – though our familiarity with online spreadsheets such as Google Sheets and Excel Online may be coloring that view. Overall, Smartsheet gets the job done – as long as you don’t mind a spreadsheet-like interface for managing projects, with the traditional hierarchy of summary tasks, regular tasks, and milestones.